At least 80 people were killed and 231 injured when a huge blast rocked a mass demonstration in the Afghan capital, Kabul, the Interior Ministry has announced. The attack was claimed by terrorist group Islamic State. Officials have confirmed to TOLOnews that at least three suicide bombers were present at the rally. The first detonated an explosives vest, the second was killed by police, while the third had a defective explosives vest. The fate of the third attacker is unknown. Graphic photos have emerged on social media showing bodies at the presumed site of explosion. "The dead and wounded were taken to Istiqlal hospital near the blast scene," Kawoosi said, as cited by AFP. Trying to reach out to friends via phone, Facebook, Twitter. This is where Facebook's Safety Check would be so helpful. TOLOnews reported that the incident took place in Dehmazang Circle during a mass demonstration. Islamic State (IS, formerly ISIS/ISIL) claimed responsibility for the attack, adding that its fighters detonated explosive belts “at a gathering of Shiites,” according to IS-affiliated Amaq news agency. Islamic State is now trying to claim responsibility for every terrorist attack both in Western countries and in the Middle East as it wants “to impose itself as the only [organization] which is able to carry out such attacks and is powerful enough to have a greater reach,” Catherine Shakdam, a political analyst and writer, told RT. However, there have been conflicting reports about the number of blasts that struck the demo. According to TOLOnews, two explosions rocked the protest. Some reports on social media suggested there might have been up to three explosions. Following the terrorist attack during a demonstration in Kabul, the Afghan Interior Ministry has announced a ban on "any kinds of demonstrations and gatherings" for the next 10 days, the BBC reports. 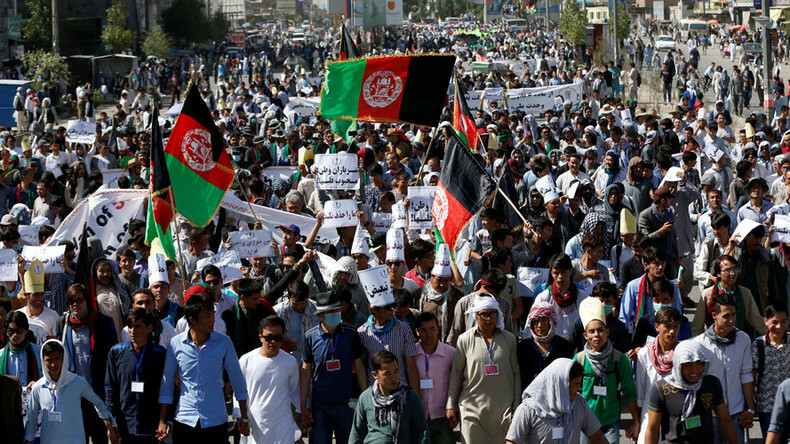 The demonstration, organized by the Enlightenment Movement, gathered to protest over the Afghan government's planned 500kV power line project. Authorities want to run the power line to Kabul through the Salang area in northeastern Afghanistan. But protestors wanted the line diverted through the city of Bamiyan in central Afghanistan. Meanwhile, Russian President Vladimir Putin sent a message to his Afghan counterpart, Ashraf Ghani, and expressed Russia’s readiness to fight all forms of terrorism together with Afghanistan. "The head of the Russian state strongly condemned this cynical crime committed against peaceful citizens and reiterated readiness to continue the most active cooperation with the authorities and people of Afghanistan in fighting all forms of terrorism," the Kremlin said in a statement. "Such attacks are a reminder that the conflict in Afghanistan is not winding down, as some believe, but escalating, with consequences for the human rights situation in the country that should alarm us all." Afghan President Ashraf Ghani said he was "deeply saddened" by the massacre. “Peaceful protest is the right of every citizen, but opportunist terrorists infiltrated the crowds and carried out the attack, killing and injuring a number of citizens including some security forces,” he added.